Ok, I'll admit it, I'm a "tree-hugger". I believe it's imperative that we start looking towards renewable resources to fulfill our energy needs, sooner rather than later. If we don't we are going to get a nasty surprise when our carbon based energy sources become much more expensive to extract (already happening with oil). And don't even get me started on the global warming implications of carrying on as we are now. But I also believe that it needs to make economic sense to "go green" because most of us are struggling to make ends meet as it is, without having to worry about doing our bit to save the planet. It only becomes a no brainer to switch to renewables when it makes sense for the environment and for your pocket at the same time. So that's why I founded this website, to attempt to make the economics of solar water heating much clearer than they are at the moment. Because right now the real monthly savings and running costs are a little fuzzy and rough around the edges. Estimates of savings are between 30% and 50% on your current electricity bill. We need to be more precise than that. And we can be... By sharing your individual performance results measured using energy monitors and smart meters on this website, you add to the collective pool of knowledge and more precisely define solar water heating performance worldwide. And that helps others who are hesitating to go solar take the plunge, because they can see exactly how much it will cost them, and that in turn is good for the environment. So it's a win all round. I hope that if you are a solar water heater owner, you will be prepared to measure and share the performance of your system on this website, for the good of the planet. Read the solar geyser reviews and heat pump reviews that home owners have already submitted. If you are investigating using solar to heat your water, the solar water heater, (DIY) plus heat pump water heater performance information and solar hot water top three list will aid you in that decision. For commercial systems ranging from 500 litres to 2000 litres I've developed and manufacture one of the most cost effective solar tanks in South Africa, based on three years of intensive research and development. 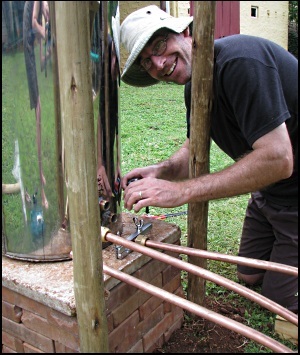 We can make a carbon reducing difference to the environment, one solar water heater at a time.